These members are 2013 NICHE Award winners. The NICHE Awards program recognizes the creative achievements of professional and student artists based in the U.S. and Canada. These awards honor excellence in jewelry making and design, as well as technical skill. 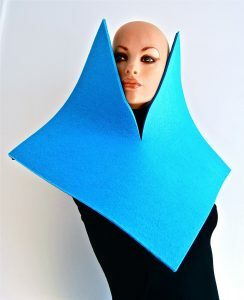 The willing pieces will be displayed at MJSA Expo New York at the Hilton New York from March 10-12, 2013. 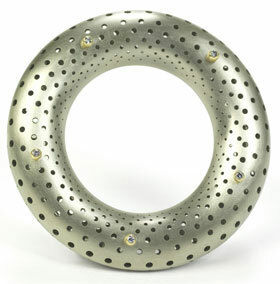 Ezra Satok-Wolman won 2nd place in the Gold Distinction category for his Pythagoras’ Cosmos brooch and tied for 1st place in the Palladium Distinction category for his Mandarin ring. 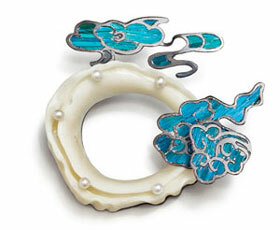 Jiarui Lu won 1st place in the Future of the Industry Awards category for her Auspicious Cloud brooch. Angela Baduel-Crispin had a necklace featured on a television show about the exhibit at the Pôle Bijou. The necklace can be seen on Monique Manoha, director of the Pôle Bijou, at 20:50 in the video. Watch here. Linda Savineau participated in “Multiples” at the Heidi Lowe Gallery, “Tongue-in-Cheek” at the Greenville Museum that was juried by Jillian Moore and curated by Danielle James, and “Fabricated” at the Target Gallery that was juried by Rachel Timmins. Kim Cridler is being featured in an exhibition at the Metal Museum until April 28, 2013. Cridler’s current body of work explore the enduring significance of the vessel form and draws inspiration from the flora and fauna around her home in Wisconsin. 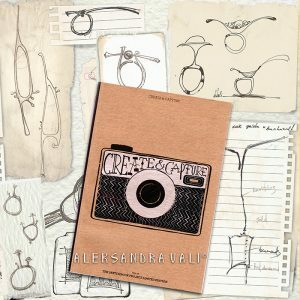 Aleksandra Vali’s sketches were published in Sketchbook Project Limited Edition, Volume IV. Michelle Pajak-Reynolds ‘s one of a kind jewelry collections were part of Nolcha Fashion Week’s award winning Fashion Lounge + Media Brunch in NY. The excuse you have been looking for to purchase the Swimsuit Edition of Sports Illustrated – Sarah Graham Metalsmithing’s jewelry is featured on several pages. Kate Upton is wearing her Rogue River Bangle (and little else) ,and her Bee Earrings and Ring look lovely on the women in the Spain story. Jean Campbell has two articles features in Beading Daily’s free eBook: Using Gems and Semi-Precious Stones in Jewelry: 6 Free Gemstone Jewelry Projects Plus Guide to Gemstone Beads. Dorothee Rosen and Megan Auman were featured in an article, 5 Designers I Loved at Buyers Market of American Craft and globalDESIGN, in JCK Magazine. Nancy Worden was featured in an article in the current issue. Rachel Columb, Kathleen Janvier, Rachelle Lim, Amelia Toelke, and Rachael Nyhus were featured in the “Crafting Excellence: The Windgate Fellowship” article. Brian Fleetwood, Rachel Columb, Amy Hamai, Kathleen Janvier, Rachelle Lim, Amelia Toelke, Rachael Nyhus, Emanuela Aureli, Nadine Kariya, Kathleen Dustin, Metalliferous, Chris’s Cables, Donald Friedlich, Suzanne Stern, and Nancy Worde all had artwork featured in the current issue of Ornament. Valerie Hector won Best in Jewelry for her outstanding beadwork at the Philadelphia Museum of Art Craft Show. Jacklyn Davidson won Best in Show at the Washington Craft Show for steel jewelry that is evocative of iron gates. Myung Urso won the Award of Excellence in Jewelry for paper jewelry using Korean papermaking techniques at Craftboston Spring. 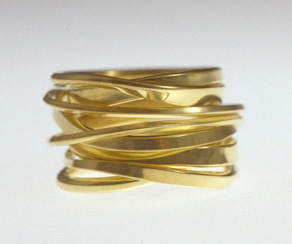 Mary Donald won the Award of Distinction in Jewelry at Craftboston Spring for her plastic jewelry, imitative of organic techniques. Namu Cho won the Exhibitors Choice Silver Award at the Smithsonian Craft Show for his metalwork composed of fused gold and silver. Kathleen Dustin won the Smithsonian Craft Show Gold Award for her clay jewelry and purses. 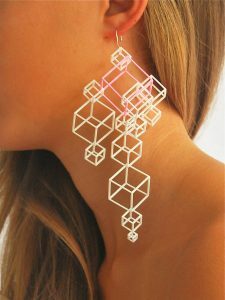 Donald Friedlich won Ornament Magazine’s Excellence in Jewelry Award for innovations in the use of glass in his jewelry. Reiko Ishiyama won the Award of Excellence at the American Craft Council Baltimore Show for her subtle, delicate silver jewelry. Biba Schutz won the Show Director’s Award at the American Craft Exposition for wire basketry and jewelry metalwork. Aleksandra Vali was quoted in MJSA Journal’s Inspiring Minds section providing her advice on participating in design competitions. In addition, there is an article on her piece La Mirage (2012 NICHE winner) in the December issue.